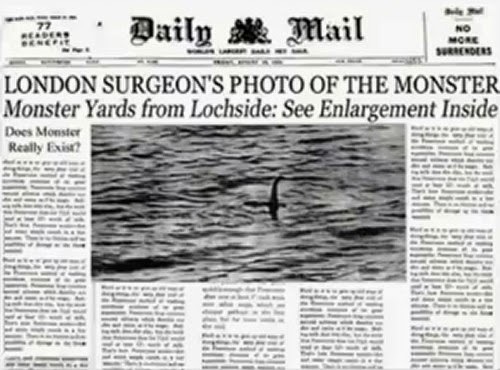 It was eighty years to the day on the 21st April 1934 that the Daily Mail introduced the most iconic image of Nessie to the world. The Surgeon's Photograph as it was dubbed caught the imagination of the world and has ever since been the lead image for the monster. Almost immediately, the photo gained acceptance amongst the monster hunting fraternity as Rupert T. Gould approvingly included it two months later in his work "The Loch Ness Monster". That was the way it pretty much stayed as Constance Whyte gave it prominence in the 1950s as did Dinsdale in his later works and into a plethora of authors throughout the 1970s and beyond. As the photograph was scrutinized for further hidden clues, things became somewhat strained as Dinsdale thought he saw a concentric ripple near the object indicating further monster activity. Meanwhile, Ted Holiday, in his book "The Great Orm of Loch Ness" claimed to see monstrous appendages in the shadows which bolstered his invertebrate theory of Nessie. The less well known monster author, Edward Armstrong, made a somewhat better effort in claiming a print defect was in fact a seagull flying past the monster, thus making it about seven foot high. To complete the list, there was also the story from the 1990s by Nicholas Witchell of whiskers being visible on a computer enhancement of the photograph. Sceptics may chortle at these failed attempts, but in their desire to look more clever than they really are, they too made themselves look a bit silly in hindsight. Roy Mackal, in his book "The Monsters of Loch Ness" pronounced the photograph to be no more than a water fowl. Maurice Burton decided it was perhaps an otter's tail caught in the act of diving, whilst the Linnean Society of London decided the object was a tree trunk thrust to the surface by erupting gases. To be fair to Tim Dinsdale, he cooled a bit on the photograph in later years, but it was the research of another monster believer, Alastair Boyd, along with David Martin that finally exposed the story behind the picture nearly sixty years after its creation. It seems the whole affair was a model neck stuck to a toy submarine concocted by Marmaduke Wetherell, Christian Spurling, Maurice Chambers and Kenneth Wilson. I won't go over the details of this oft repeated story, but suffice to say the case is closed for me and the majority of Loch Ness Monster researchers. Some unanswered questions remain, such as the nature of the less well known second photograph of the object submerging. To this day, there is no satisfactory explanation for this, and given the various failed sceptical theories about the first photograph, I wouldn't assume they have a grasp of the situation either. Critics may often accuse "believers" of accepting any old evidence, but I think that ad hominem has been disproved in this case (well, perhaps some still accept the picture as evidence). But what of the man himself, Robert Kenneth Wilson? In an article from the ANZ Journal of Surgery published in December 2007, some more facts are revealed about him. Born on the 26th January 1899 into a medical family, he developed a love of firearms and joined the Royal Artillery in 1917, only to be wounded in action on the Western Front in 1918 (which left him with a slight limp for life). Gaining the Fellowship of the Royal College of Surgeons in 1926, he established a practise in Queen Anne Street near Harley Street, specialising in gynaecology. His expertise in firearms led him to be an expert witness in court trials and his expanding collection occupied three walls of a special room at their Highgate residence. The outbreak of war compelled him to donate the guns to the Metropolitan Police as personal armouries were outlawed. He also wrote a book on the subject of firearms. The Nessie hoax with his shooting partner, Maurice Chambers, was a mixed affair to Wilson. The Daily Mail bought the picture from Chambers for £100 (over £6000 in today's money), but the British Medical Association fined Wilson £1000 for allowing his name to be associated with the picture! This was deemed as advertising and therefore improper for what his wife Gwen deemed a "silly prank" to their children. It was claimed in this 2007 article that Maurice Chambers had confessed to all in his will after he died in 1944. I have examined a copy of the will obtained through the usual means, but have found no such confession. Wilson again fought for his country in the Second World War, seeing action in France, Germany and the Far East. For these he was awarded the French Croix de Guerre and the Royal Orange Order of the Netherlands. Having moved to Australasia in the 1950s to continue his medical practice (picture below), he retired in the mid-1960s after a stint with the Australian Petroleum Company. Our short story ends with Kenneth Wilson dying on the 6th June 1969 in Melbourne from oesophageal cancer. Kenneth Wilson was obviously a brave and talented man, but even he and his co-conspirators could not summon the courage to come clean on a photograph that unexpectedly swept like wildfire around the world. Such is the power of the appeal of the Loch Ness Monster and eighty years on we look back on his part in this appeal with mixed feelings.